Try as I might, I can't yet find a candidate to cheer for in the presidential race. It may be that in the line-up there is a dark horse who might surprise us all, but they'd better get a move on. Mind you, with Ireland in its present mood, I guess we should be grateful that the electorate aren't being given the option to vote for Ivana Bacik, Panti Bliss or Dustin the Turkey. A major problem is that we don't have a clear idea of what the presidency is about. At least in the United Kingdom, where I live, the role of the monarchy is clear. As the great Walter Bagehot pointed out in the 1860s, while the government was the ''efficient part" of the constitution - that is, it ran the joint - the monarchy was the "dignified part", whose job was to "excite and preserve the reverence of the population". The Queen is bred to understand the limitations as well as the requirements of her office, and neither thinks she's in charge nor wants to be. And the populace in general is very happy with an arrangement that offers continuity and spares us the dangers of being saddled with an unknown quantity. You can see the great advantages of this separation when you look, for instance, at France, Russia and the US. Like many a president before him, Emmanuel Macron is showing distinct signs of longing to be an all-powerful emperor, and, as he orders executions, Vladimir Putin behaves like one. And then we have Donald Trump, yet another American president lumbered like his predecessors with the impossible combination of having to combine the dignified with the efficient part as head of an enormous country. Obama was fine at the former and poor at the latter. Trump is not cut out for the former but is certainly approaching the latter with brio. In Ireland, because of our habit of having politicians in the job, there will always be a crossing of boundaries. We're asking people who lived for politics to do the impossible and neuter themselves and unless they're completely clapped out, it comes hard. And we avoid grown-up conversations about the role of the presidency and respond to often meaningless rhetoric. So what's the choice this time? Well we all know Michael D, who has been conscientious and mostly didn't embarrass us with the neighbours, but there are serious drawbacks to re-electing him. His personality, which causes him sometimes to ignore the boundaries of his job, has had him accused of meddling in politics, and his knee-jerk hard-leftery has occasionally besmirched his office. There was, for instance, his extraordinarily begrudging statement about the death of Margaret Thatcher - who, whatever you think about her, was an outstanding prime minister who was seen as a heroine in, for instance, eastern Europe and the USA. "She will be remembered as one of the most conviction-driven British prime ministers who drew on a scholarship that demanded markets without regulation." And then there was the lengthy eulogy to a dictator who among other wickednesses ordered hundreds of brutal executions, persecuted clergy, gays and political and other dissidents and caused hundreds of thousands of refugees to flee. "Fidel Castro will be remembered as a giant among global leaders," began one sentence that was beyond parody, "whose view was not only one of freedom for his people but for all the of the oppressed and excluded peoples on the planet." What's more, although he obviously is enjoying the job, President Higgins is just too old to take on another seven-year contract, as were Douglas Hyde, Sean T O'Kelly and Eamon de Valera, the largely inactive and often ill presidents who occupied the Aras between 1938 and 1973. And, in my view, the job has gone to his head. When he was asked legitimate questions about, for instance, money, he was affronted. It's been very selfish of him to put himself forward again, especially in the way he did - reneging on his promise to serve only one term, delaying announcing his decision until the very last minute and thus making life difficult for his rivals. Fair play to Peter Casey for bluntly spelling much of this out. 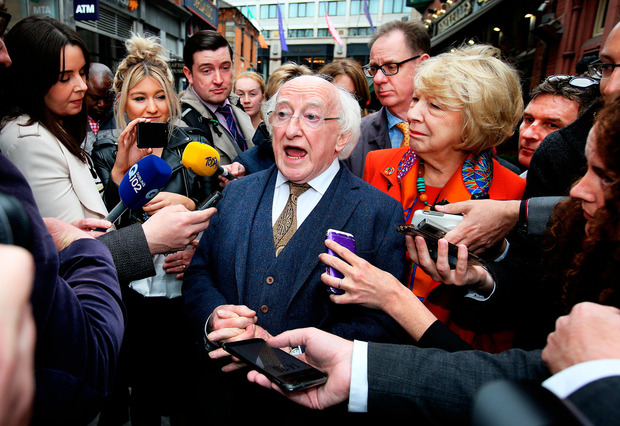 In his role as a candidate, Michael D does not deserve deference. Since I suffer from the disadvantage of having never watched Dragons' Den, I haven't yet been able to get a sense of Casey, except that his outspokenness on Higgins and on issues like neutrality, like his business career, show he has courage and thinks for himself. But, as he says, the presidential campaign is "bizarrely short". Is he really enough in tune with the Irish public to be accepted as its representative abroad? I also worry about his enthusiasm for involving the Irish diaspora bigtime and what that might lead to. Like more than half of those recently polled by TheJournal.ie, I don't think the vote should be given to non-residents of the State. Gavin Duffy has also ventured to tick off Higgins for "playing politics", knows what the job entails and has the media experience to avoid disasters, but is that enough? Joan Freeman seems like a decent, selfless woman, but has she the stamina for seven years of remorseless meeting and greeting? As Austin Stack and Ann McCabe have pointed out forcefully, Liadh Ni Riada is unfit to be considered for the office. It would be grotesque to have as commander-in-chief of the armed forces someone from a party that justifies murders of servants of the State and denies that atrocities like Bloody Friday, Warrington or Birmingham were acts of terrorism. And then there's Sean Gallagher, who was probably robbed of the last election by RTE bias and Sinn Fein skulduggery, and has a considerable claim at the very least to the sympathy vote. There was a lot of snobby sneering at him during the last campaign, and he'll never be able to deliver the literary flourishes that Michael D delights in, but there's more to our country than Yeats, and maybe an entrepreneur might refresh the office. If the political parties had had the bottle and given us candidates we actually knew, like Bertie Ahern and Enda Kenny, there would at least have been a sense that the electorate was making an informed choice. But maybe during the next few years we should seriously consider the nature of the presidency and what we actually want of it. In a long conversation about this the other night with two friends, who like me, are historians, we tried to think of the ideal candidate. We rejected them all until the name of Tramore-born and Trinity-educated Louise Richardson came up. As a teenager, she was an IRA sympathiser, but she ended up as an expert on terrorism. As principal of St Andrews, she saw off Alex Salmond when he tried to force her to take a political position on independence, and as vice chancellor of Oxford she refused to give into intimidation from students seeking to cleanse the campus of statues of people of whom they disapproved. It was after midnight by then, so we settled on her, with the stipulation that she should be allowed to do it as a part-time job which would be much more appropriate for a small country. At least talking about that caused us to think. These are conversations we should be having well in advance of the next presidential fixture, not just before the off.